Cars are usually written off as depreciating assets, but this one is anything but. There’s a big difference between asking prices and what a customer actually ends up paying for a car, and while asking price can many times be an indicator of the trending direction of a car’s worth, it’s not indicative of a car’s actual value. 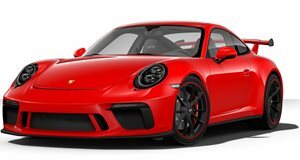 That’s why when we heard that some Porsche 911 R examples were going up for sale with asking prices north of seven figures, it was a good indicator that the special edition car was an instant collectible. Now, as Road and Track reports, that notion has been set in stone by a 911 R that went up for sale at an RM Sotheby’s auction in Paris. As part of a charity event, the rare Porsche, one of only 991 ever built, was sold to a collector for €515,200 ($550,000), a substantial bit higher than the car’s base sticker price of $185,950, but admittedly, this 911 has some additional goodies that help jack up the price. First and foremost, it’s worth noting that this Porsche is one of only 10% of 911 Rs finished in a color other than silver or white with red or green racing stripes. Instead, this one gets slate grey paint accented by yellow lettering as a part of Porsche’s paint-to-sample color that costs $6,000 and we have to say it looks damn good. It also gets a lighter single-mass flywheel that shaves 11 pounds over the standard dual-mass version and adds $3,650 to the car’s price. Then there’s the Sport Chrono pack, a front nose lift, bixenon headlamps, and even a placard on the dash with a Steve McQueen quote that reads, “Racing is life. Anything that happens before or after is just waiting.” Also meriting mention is the fact that a quarter of the car’s sale price was donated to a children’s cancer charity, meaning the actual price paid for this 911 R was $412,000 for what essentially boils down to a slightly altered Porsche 911 that slots between the GT3 and GT3 RS and comes standard with a six-speed manual gearbox. To be fair, this example is a good way to negotiate down the price of the 911 R from dealerships asking for an arm and a leg, but it’s also good incentive to get collectors onboard to buy what appears to be an appreciating assert.